An all-round lawn maintenance machine. Able to handle scarifying, lawn raking and collecting, the Combi Care 38 P is a perfect petrol machine for looking after your lawn. With a 55 litre collector, as well as changeable scarifying and raking cartridges, the Combi Care 38 P will allow you to keep your garden looking its best, all year round. The scarifying mode uses 14 steel blades and a working width of 38 cm, while the raking cartridge has 24 steel spring tines, and a working width of 37 cm. The cartridges can be easily changed without tools, meaning taking care of your lawn has never been simpler. The 38 P includes five-stage working depth adjustment with just one hand motion. 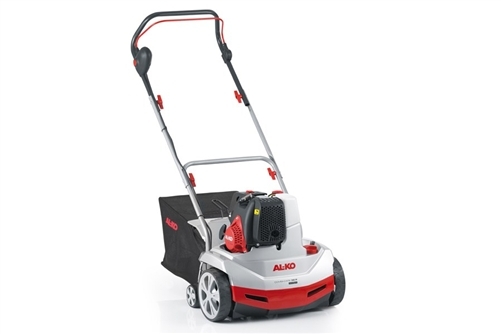 This allows you to ensure the blades only just touch the ground when scarifying, which is the ideal way to use the machine, avoiding the blades wearing down unnecessarily and reducing damage to the roots. The handlebar is also adjustable, so you can match the working height of the machine to your stature and comfort. This also means that you can store the machine away as compactly as possible, saving space particularly over the winter when you might not be using your equipment. Comes with a 2 year conditional domestic warranty.